Investigate the South Atlantic Bight shoreline by creating a scale model and identifying surface current patterns using sea surface temperature data. Also observe the dynamic nature of the Gulf Stream. Ideal for grade levels 6-12. Focus Question: How does the shape of the sea floor influence surface current patterns? Be able to set up a scale model of the South Atlantic Bight shoreline and sea floor morphology, including the Charleston Bump. Be able to identify meanders, filaments, and eddies in surface current patterns. Use Gulf Stream sea surface temperature images from remote sensing satellites to identify meanders, filaments and eddies in the temperature trace of the current surface. Use interactive mapping model from coastal ocean observing systems (secoora.org) to observe the dynamic nature of the Gulf Stream in different seasons or over short periods of time, eg, before and after storm events. Procedure: Work in groups of 3-5. Using the laminated bathymetric maps of the SAB and non-permanent marking pens, identify the continental shelf, continental slope, and circle the Charleston Bump. Note any other major morphological features you see on the sea floor that might have an effect on currents. Use clay to create a model of the SAB sea floor morphology in your container. The clay layer should be thin– no more 1-2 inches thick at the edges. Your model should show the shoreline from Cape Hatteras to Cape Canaveral, including the continent shelf, the continental slope and the Charleston Bump. Pour a diluted solution of Rheoscopic Fluid (or water to which you added food coloring) over your model to a depth which just covers the Charleston Bump. Use a drinking straw (hairdryer or fan) to create a gentle “wind” blowing from the south to start a current, running along the shoreline. Carefully observe the current(s) you created. Record and illustrate your observations on the current patterns that develop. Describe the movement of your current. If you observed any meanders and eddies, where did they occur? What were the morphologic or bathymetric features under the meander or eddy? Record this information in the analysis/observations. Illustrate the circulation patterns affected by the shoreline or over the Charleston Bump. Record your illustrations in the analysis/observations. Clean up procedure: return the Rheoscopic Fluid to the container, using turkey baster or funnel. Dry the clay with a paper towel, then remove it from the container. Roll the clay into a ball and store it in a plastic bag. Western Border of the Gulf Stream and note any circulation patterns of interest — curves, filaments or eddies. Outline any cool water currents and note any interesting curves or eddies. Compare what you observed from your model to the image of Gulf Stream. Record your observations on the current patterns from your model. Record any correlations between the surface current patterns to seafloor bathymetry in your model? Describe the movement of your current patterns—meanders, filaments, eddies? Illustrate (draw) the patterns created by the shoreline and around the Charleston Bump. What are these patterns called? Were there morphologic or bathymetric sea floor features under the meander or eddy? What does remote sensing image show about surface currents? Describe how your simulated currents compared with the SST image? How do you think whales use currents near the South Atlantic Bight? How would US Coast Guard Rescue Teams use information about circulation? Conclusions: Explain the influence of seafloor morphology or bathymetry on surface current patterns? Extension: Use real time information for Gulf Stream images. 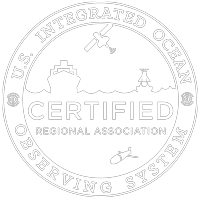 Coastal ocean observing systems locate instruments with sensors on buoys, towers, satellites and land based radar. They gather information about ocean wind, temperature, waves and currents. This information is programmed into mathematical models. Models are developed into interactive map which displays currents and ocean conditions. Extension Focus Question: Is the Gulf Stream dynamic? Then click on SECOORA Interactive Map. Look at today’s interactive map of SST (sea surface temperature). Is the Gulf Stream easy to spot? How do you find it? Choose a date in another season (winter or summer for the most contrast) to view the SST interactive map. Now what do you see? Choose a date when the Gulf Stream is most visible by SST and check a time 2-3 weeks before or after this date. Is the Gulf Stream and its meanders in the same position? Is the Gulf Stream a static or dynamic current? How is like or different from a land river. What are its boundaries or borders? The measurement of the depth of the ocean floor from the water surface or the underwater topography of the ocean floor. The Charleston Bump is a topographic rise on the continental slope off Georgia and South Carolina. The slope off the southeastern US is unusual, in that it is split into two parts. At the edge of the shelf (55 m), the steep slope begins, and goes down to about 400 m. Then it flattens out and gradually slopes down to 1000m. At 1000 m, a steep slope then begins again, dropping rapidly to 3000 m. The relatively flat area between 400 and 1000 m is the Blake Plateau. On this plateau, the Charleston Bump rises steeply from depths of 700 m up to 400 m. The rise is so abrupt that it deflects the Gulf Stream offshore, and "riffles" can be seen on the surface as the Stream flows over it. The usually shallow, very gently sloping actual edge of the continent that is under water. The continental shelf was once dry land and varies in width along the SAB from 10 miles off the coast of Florida to 80 miles off the coast of Georgia. The edge of the continental shelf. It has a much steeper slope than the continental shelf and extends down to the deep ocean floor. A curved extension of a current, not a completely separated as in eddies. The Gulf Stream is both the name of a current and a current system. The Gulf Stream current is a warm western boundary current that flows northward off the coast of the east coast of North America. The Gulf Stream System originates in the Caribbean Sea, travels through the Gulf of Mexico, speeds up in the Straits of Florida, travels north along the coast of the United States and continues across the North Atlantic Ocean. The Gulf Stream and other ocean currents do not have well defined boundaries and therefore do not travel in a straight line. They follow a wandering, winding course that is caused by deflections from seafloor bathymetry or projection of the shoreline. Meanders may also be caused by friction with neighboring waters causes the current to form waves or curves. Another cause is the strong differences in strength of the flow within the current itself. If the flow in the main current becomes so curvy that it cuts off a meander, an eddy is formed. Shape of the sea floor. "Rivers" of water in the ocean. The two major types of ocean currents are surface currents and density or deep-ocean currents. The bottom of the ocean which could be in deep or shallow water. It is many features, some shaped by sea level changes on the continental shelf and some shaped by plate tectonics, including ridges, volcanoes and rifts. Collect information from a distance. Airplanes and satellites carry sensing instruments: such as electromagnetic radiation, gravimeters, lasers, magnetometers, radiometers and scanners, radio frequency receivers, radar systems, seismographs, scintillometers. sonar, and thermal devices. The place where the continental shelf begins to slope. The continental shelf and ocean region created by the curve between the Cape Hatteras, NC and Cape Canaveral, FL. Ocean currents that occur in the upper 400 meters of the ocean. They may be affected by wind speed and direction, temperature, salinity, the bathymetry of the ocean floor. The physical shape of the land’s surface features. Ocean currents transport water over long distances and to great depths. Currents flow in complex patterns driven by: 1) Wind created by atmospheric pressure differences originating from the sun’s energy; 2) Density differences controlled by the water’s temperature and salinity; and 3) The pressure gradient caused by differences in sea surface height. Currents are also affected by bottom topography and the earth's rotation. Surface currents are driven by wind and only extend to depths where wind-derived energy can penetrate, usually the upper 200 m. Deep currents are formed when dense water sinks. Most deep currents are driven by the cooling and sinking of ocean water in polar regions. Deep currents are an important component in long term climate change. Ocean currents result from several factors: a. wind blowing over the water; b. pressure gradients (much like water piling up on one side of a bucket) from differences in temperature, salinity and sea surface height; c. the Corolis effect from rotation of the earth; and, d. outflow from rivers. The major driving force of surface currents is the wind. Friction between the wind and the water sets these currents in motion. The winds that drive surface currents are the Westerlies that blow west to east at 40 degrees to 50 degrees latitude and the trade winds that blow east to west at 20 degrees latitude. These winds force large volumes of water westward toward the continents where they "pile-up" and flow northward along the margins of the continents. Surface currents occur in near shore waters with a maximum depth of 400 meters. They are shaped by the Coriolis effect, the pull of gravity and the position of the continents. As the earth rotates, both air and water currents are deflected to the right (clockwise) in the Northern hemisphere. These deflected currents become western boundary currents such as the Gulf Stream. The Gulf Stream, the major surface current bordering the South Atlantic Bight (the region from Cape Hatteras, NC to Cape Canaveral, FL), is a warm current because it originated in warm latitudes. Air above a current is either warmed or cooled by the water and therefore currents have an important effect on the climates of near by land areas. Surface currents transfers energy to the water below it, creating deeper and deeper motions, which not only flows slower, but also flows more to the right than the one above. Surface circulation patterns, for example in the Gulf Stream and coastal waters, often show meanders, reminding one of winding rivers. Meanders are commonly caused by deflection from seafloor bathymetry (shape of the ocean floor) or projections of the shoreline. Another cause is the strong differences in strength of the flow within the current itself. If the flow in the main current becomes so curvy that it cuts off a meander, an eddy is formed. The central core of the eddy contains non-current water. The science and operations of coastal ocean observing systems bring new information about surface circulation. Information gathered from various buoys, towers and remote sensing techniques provide scientist with valuable information about currents such as the sea surface temperature (SST) which is often used in the prediction of the paths of hurricanes. Society will benefit by better search and rescue methods, improved tracking of oil spills and other pollutants, and greater knowledge about severe weather, such as hurricanes. Understanding currents allow ships can take the most efficient path to save fuel or for set up a winning route in sailboat race. Fishery scientists can incorporate the larval distribution of fish into better management plans. Activity modified for COSEE SE by Lundie Spence, Margaret Olsen, and Katie Greganti. 10-10-06 Please direct comments to Lundie.spence@scseagrant.org .